Playoff baseball is unlikely to visit Colorado this year. There’s no need to print a bunch of Rocktober shirts. Colorado dropped another ballgame on Monday, a 4-3 decision to Philadelphia, and is now 13-22 on the season. That’s the worst record in the National League, and 10 games behind the front-running Dodgers. There’s plenty of blame to go around for Colorado’s lousy start. The offense ranks 28th in runs, the pitching staff sits 30th in ERA, the fielders sit 24th in defensive WAR (for whatever that means to you). If you see these guys at the ballpark, spread the boos equally. Alas, there is one reason for optimism here. Because of a quirky early-season schedule and some wonky weather, the Rockies have only played 14 home games through their open 35 matches. That’s the lowest ratio in the NL, by far. By comparison, every other NL West club has played 20 or more home games. Maybe it’s a good time to kick the tires on a possible Colorado buy-low. The team might not improve much, but surely the offense is better than this. Nolan Arenado and Charlie Blackmon are off to reasonable starts. Carlos Gonzalez owns a terrible set of numbers thus far, but he did homer twice in the just-completed Los Angeles series. Wilin Rosario figures to get a fair amount of playing time on the fresh homestand while Justin Morneau (concussion) isn’t available. Nick Hundley is a recommended catcher rental when the club is at home. Start your engines, Colorado. Gravity always wins. • If you have streaming on your mind, perhaps we can interest you in David Phelps. The Marlins right-hander has been terrific over his last five starts, posting a 1.72 ERA and 1.18 WHIP over 31.1 innings. The ERA and WHIP don’t link up, of course, and he’s suspiciously been homer-free all year, but when we see 24 strikeouts against just four walks, we’re more inclined to trust the story. The Diamondbacks offense has been productive at home, but it’s just 24th in road scoring. Pack your bags, get to Miami for Wednesday. Phelps is owned in just nine percent of Yahoo leagues. • If you look at the clouds long enough, you’ll swear you see some distinctive pattern or significance. Maybe that’s the problem I get with Brandon Crawford. I spend some time on his stats and splits and I want to see something here. If you hopped on board the Crawford train a while ago, you’re enjoying the profits now. He’s currently sitting on a .285-20-6-25-2 line, the second-best shortstop-eligible through the first six weeks and change. 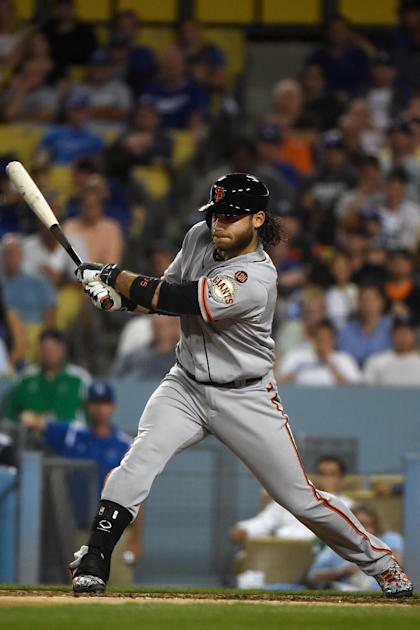 Crawford normally shows a power spike on the road, away from the expansive AT&T Park, but thus far in 2015 he’s hitting everywhere (.894 OPS at home, .891 OPS on the road, three homers in each bucket). He’s also drawing plenty of walks, making him a solid option in OBP leagues. And as he’s done for much of his career, he’s actually batting better against lefties than he is against righties. Crawford is hitting the ball less in the air this year but that’s not a big deal: his hard-hit rate has spiked (pushing his line drives as well), and his soft contact numbers are also down. Perhaps extra aggressiveness is working for him, as Crawford’s actually offering at more overall pitches, and even more pitches out of the strike zone. It will be interesting to see how pitchers counteract that going forward. Crawford’s excellent defense doesn’t have a direct fantasy tie in, but at least it keeps him in the lineup. He’s all over the order, slotting anywhere from fifth to ninth, depending on the park and opponent. Sounds like someone who should be owned in more than 52 percent of Yahoo leagues. Sunny days, sweeping the clouds away. • Are we having fun with this Curtis Granderson story? He’s on a .281/.354/.544 binge in May, with four homers and a steal. He’s nudged his walk and strikeout rates slightly, doing a little bit of everything. Consider his end-of-year pace: .252-91-21-54-12. If he can hold that level of production, it would be his best average and steal total in four years, and his best run total since 2012. He's currently a Top 40 outfielder in the Yahoo game. It might be tricky to trust the stolen bases, since Granderson is into his age-34 season. But let’s give him credit for controlling his at-bats again. He’s only swinging at 18.1 percent of pitches outside the zone, a notable improvement. His contact rate is also at an all-time high. Whatever you paid for Granderson in March, you probably earned a profit. And to think, you can still get in on this story in 64 percent of Yahoo leagues.